I hope all of my US peeps had a great holiday weekend. Now it’s time to gear up for all the yearend duties and start thinking about 2018. 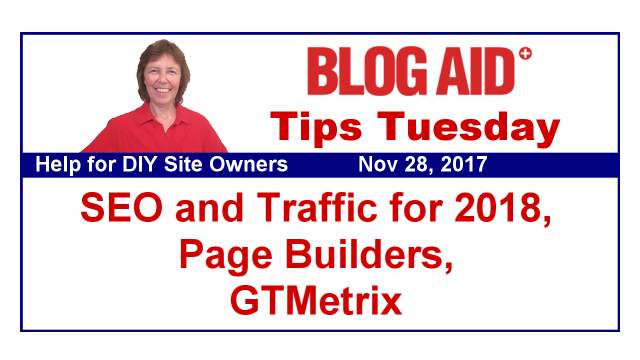 Thanks to all the BlogAid News subscribers who took advantage of the extra special discount on the DIY SEO course and hosting deals over the Black Friday / Cyber Monday holiday. For those in the DIY SEO course, go ahead and get started on the Yoast SEO and Google Connections video tutorials. That goes for those of you who have been in the course for a while too. The tutorials have been updated for changes to the Yoast plugin and for your HTTPS settings in Google Analytics and Search Console. I’m busy revamping the live SEO Workshop that’s coming up in January. For those of you who took it in March, you’re definitely going to want to take it anew. There have been significant SEO changes in 2017 and even bigger ones are coming for 2018. This Workshop will help you get your site ahead of those curves. I’ll have full details on the Workshop sessions for you in a couple of weeks. If you rely on Pinterest or Facebook for the majority of your site traffic, you need to listen up. That bubble is already starting to pop and it’s going to get worse. I’ll be addressing that in the SEO Workshop too, and helping you get your site in line with the new requirements to keep the traffic coming. It’s going to take 3-6 months for the changes you make to take hold. But you’ll be established when those 2018 huge changes hit. Folks who wait to make changes until they are already in pain are really going to fall behind. Site owners who are ready will zoom right past them. Newer site owners, this is also your opportunity to zoom past more established site owners who refuse to change. I’m really looking forward to attending WordCamp US in Nashville this weekend. I hope I get to meet Matt Mullenweg in person at the after party. You may remember last year I had a private chat with him on what’s coming for WordPress and I’ve been releasing that info to you as allowed. There are more changes on the way and I’m looking forward to hearing about them in his State of the Word address. I’m also looking forward to attending Contributor’s Day on Sunday. I’ll give you full report next week. Is it Safe to Update to WordPress 4.9? I still haven’t updated any of my BlogAid Sites yet because I just couldn’t take the chance on disrupting them during the recent holiday sales. That’s especially true on my membership sites for DIY SEO and Webmaster Training where I have media players and transactions happening. I will be updating all of my sites this week, though, and I’ll let you know how that goes. I’ll likely do that in a BlogAid Today Tip livestream on the BlogAid Facebook page. You can also catch those replays on the BlogAid YouTube Channel. But besides the slider I reported it having an issue with, I haven’t heard of anything else, so I’m thinking it’s safe for most folks to update now. Just update your plugins first. And, as always, take a full backup. Heads up to anyone using a page builder for their theme, like Thrive, Divi, Beaver Builder, and others. I do believe their days are numbered. I don’t think they will fold in 2018, but I’d be surprised if all of them see the end of 2019. WP Tavern reports that the Tailor Page Builder plugin is being discontinued. It wasn’t ever that popular. And now with Gutenberg right around the corner, they just don’t see a future in it. As I’ve been reporting all year, Gutenberg is not just a new text editor. It represents the start of a revolution in WordPress itself. It will eventually develop into more of a page builder. At least that’s the plan as far as we can tell. I don’t think even that will replace solid premium themes like Genesis because it will always have better built-in SEO and other features, especially the niche themes, like those for the foodie bloggers. And builders like Beaver Builder, that integrate with Genesis, probably won’t go anywhere in the next 2 years either. But bloated builders like Thrive and Divi, that rely so heavily on shortcodes, will likely decline significantly in the next 2 years. So, if you own one of those themes, or you’re a designer that relies on them, you need to start planning for your future. The sooner the better. Want a peek at what’s coming for SEO in 2018? Read this nice post on Yoast to get an idea. He also did a recent interview on the StudioPress Podcast talking about how much more prominent he thinks AMP will be in 2018, including AMP-centric themes. Keep in mind that Yoast’s big money clients ain’t us little bloggers. So, vet the audience he’s talking to, and about, with some of the advice and changes. Same holds true for voice activated SEO elements. Before you implement those suggested changes, think about what content you create that someone would ask about and be satisfied with only receiving a voice response. I don’t think that’s most of my clients. I mean, if you’re showing folks how to flip a flea market find, you just can’t do that without images. Same with a recipe. But, can you write a post on ingredient substitutes? Or maybe measurement equivalents or tips for removing a rusty bolt? That’s the kind of thing someone would ask. This is the kind of thing I’m going to be covering in the SEO Workshop, and how to format your posts to have a better shot at getting into the Google Knowledge Graph too. WP Tavern is reporting one issue with WordPress 4.9 that won’t affect most site owners, but will affect designers and developers. Seems that when you create a new page template, it doesn’t show up in the list where it should. Has something to do with the new file editor. Check the WP Tavern post for more details. Oh, I really like the new code editor in WP 4.9. The formatting is so nice. But, I did run into one little thing that I hope is a bug. When you do a search using the browser by hitting Cntl+F, it brings up the search box, but there is no down arrow or more button or such. So, it will jump to the first instance, but you have to scroll to see them all highlighted after that. It works, as far as finding them. But I’d like to keep hitting the Enter key to have it jump to the next instance to be sure I don’t miss one. That seems faster to me than scrolling while having to scan through the code looking for highlights. Over the past few months the online performance tester, GTMetrix, has been making some significant updates that you’re going to like. They’ve updated both the FireFox and Chrome browser versions they use in the tests. And they’ve added a new metric for what they call first contentful paint. Basically, it’s the time it takes before a visitor sees meaningful content, or time to paint, as it’s more commonly referred to by webmasters. FYI, be sure to sign up for a free account with GTMetrix so you can log in and run tests from locations other than Vancouver Canada. I like to run from Dallas or other central locations, and run unthrottled too. My workhorse tester, WebPage Test, along with several other testers that I use in Site Audits have either significantly changed their interface or upgraded the tests they run in the last year. So, it’s about time for me to make new tutorials for Level 4 of the Webmaster Training courses. Those are actually next on my list after I get back to the WP Rocket tutorials. And those are right after I finish the unexpected new tests on WP Fastest Cache. And maybe it’s a good thing I’m behind on those because I think they may have fixed the issue I found with not being HTTPS aware. But now I’ve found that it can goof with other redirects, because WP Fastest Cache always puts its directives first in .htaccess. So, I’ve added that to my list of things to check. It just keeps getting deeper, doesn’t it? One thing I love and hate about this job is that there’s always something new to learn, and everything changes all the time too. Poor little ole InMotion Hosting has been having issues since the weekend. Most sites are up, but you can’t do some things in cPanel. I did some after-audit fixes on a client site Friday and all of the files and such had been reverted to the previous day’s state on Saturday. Basically lost all of the changes I made. That was a little scary. It’s as if it got reverted to a host backup. As of the time I wrote Tips Tuesday, I still couldn’t work on the files. Considering most all of those changes were security related, we’re crossing our fingers until I can get back in there. I’ve been seeing similar disruptions at other hosts, especially with regard to database connections and updates on mySQL. So, something’s up, and it’s likely they will never tell us what, especially if it’s security related. All hosts go through hiccup periods. So just be patient until it passes. Just before the holiday, WordFence announced that they have expanded beyond WordPress security services enough to warrant rebranding the company. The new name is Defiant. Looks like the name of the WordPress plugin will remain the same. This was a fun video to watch. Ever wonder how CloudFlare successfully randomizes the encryption they use to keep your data safe as it travels from them to the visitor’s browser? There is no algorithm that can be written to produce randomness at that level, and one that can’t be broken. So, they take snapshots of their wall of lava lamps periodically and their random changes generate the rotating encryption. Go watch for yourself, it’s pretty neat.